At night, this mischievous bunch peeks out from under your bed. When you hear that creak . . . creak . . . 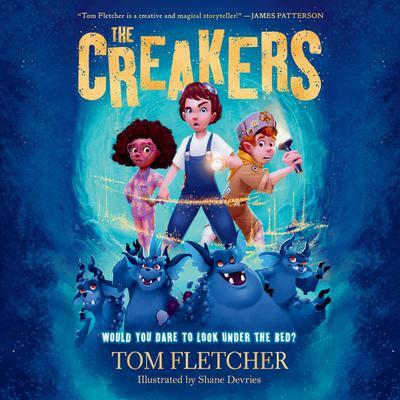 THE CREAKERS are there! Discover a hilarious and eerie middle-grade story by a UK star. What would you do if you woke up to a world with no grown-ups? When all the parents in the world disappear, most kids think this is amazing! They can finally run wild and eat candy for breakfast, lunch, and dinner. But Lucy Dungston wants to get her mom back, especially because her dad disappeared not long ago. Lucy wants the truth, and she's convinced that the creaking sounds that come from under her bed can lead her to it. Creak . . . creak . . .
That's when Lucy meets the Creakers, a bunch of sticky, smelly creatures who live under children's beds. This troublesome bunch has taken all the grown-ups to an upside-down world called the Woleb. Lucy must act fast if she wants to rescue the grown-ups, because adults who stay in the Woleb too long start becoming Creakers!